What Happens Inside Internet Detox Camps in China? Treatment for video game addiction? Although Internet / video game addiction treatment centres are becoming more common in North America and Europe, countries like China and South Korea have been offering “detox” camps for years. A new documentary called “Web Junkie” takes a peek inside one of 400 video game detox centres in China and follows three boys during their one month treatment. Treatment at the military-style boot camp does not come cheap – at 10,000 Yuan, this is double the average monthly salary in Beijing. But when parents are desperate, they will do anything to help their children. 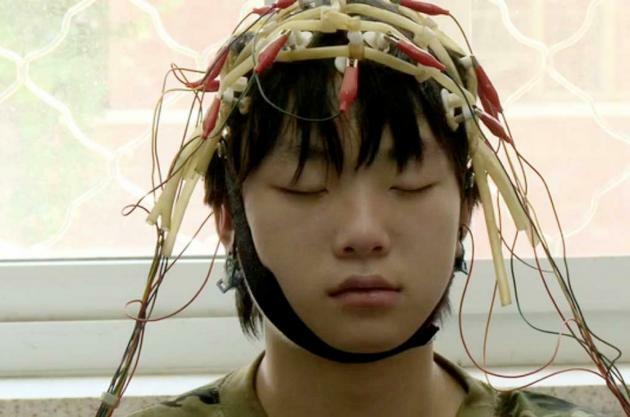 Although the film (not surprisingly) does not provide all the details on what “treatment” for video game addiction entails, it does show the boys navigating military obstacles, receiving medical treatment, participating in family therapy, and having their heads covered in wires to monitor their brain activity (see the picture above). What do you think? Would you ever consider sending your child to a similar detox camp for video game addiction? Posted on January 30, 2014, in Uncategorized and tagged boot camp, china, documentary, internet addiction, parents, teens, video game addiction treatment, web junkie. Bookmark the permalink. 2 Comments. Reblogged this on erika is here to eat your food.